It’s a beautiful day here at Buffalo Niagara International Airport. Your white planes, with their gray/green logo-festooned tails look particularly striking against the blue-wash sky and gray tarmac. 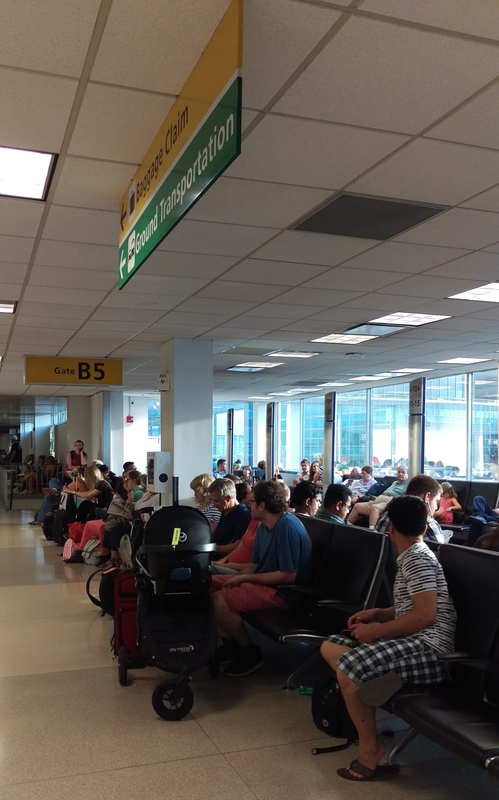 I’m sitting here at Gate 10, surrounded by what is rapidly becoming a small community of marooned souls, and in that group I am including Jessica, the gate agent. The magic gate to home, which I did not cross. Nonexistent passengers watching Jessica the Gate Agent trying to convince United’s computer system that we are real. I had not planned on being in Buffalo today, United Airlines. But on Tuesday, my oldest daughter sent me a text. Liza: Mom, it looks like (Cousin BC) died, yikes, so sad. Liza: I saw on Facebook. While those books gave me a window onto a world in which parents supported and respected their kids, BC’s parents – who are 10 years older than I am – showed me how to live in it. Nearly 40 years ago, they gave me a ride from Boston to Utica. I don’t remember the particulars of that ride. The feelings associated with it? They’re still with me. Which is the reason that even though the only thing I could do to make it better was nothing, I had to get myself from Milwaukee to Syracuse for a 1 p.m. Friday funeral. I take my job pretty seriously, United. And unlike Jessica the Gate Agent, whose superiors seem to have no problem letting her get squashed under the metaphorical bus – or maybe I should say plane in this case? – I have a supervisor who is fair, consistent and leads by example. I guess I should thank you for reminding me once again how lucky I am. Point being, my supervisor had assigned me a rather large and important deadline-critical project. So I needed to make the trip with as little time off as possible. When I went looking for flights, it turned out that it was actually faster to get to Uruguay or London. Direct flights between small cities? Fuggehdabout it. The best I could do was Chicago-Buffalo, rent a car and drive the nearly three hours to Syracuse. You had two morning flights and a 9 p.m. one. I booked the late flight and took work home the night before so I could get the project finished in time to leave work an hour early, then go home and throw a few things into a carry-on bag. In addition to black attire, I packed a bag of fresh green beans and the newest Apocalyptica release. That no liquids rule eliminated the possibility of an energy drink, and I knew I was going to need help staying awake. Working a near-full day followed by a 90 minute bus trip to catch a flight that leaves at 9 pm and arrives at midnight, then renting a car and driving another hour-and-change to somewhere you’ve never been before (another cousin’s couch) is, as long as we’re being honest, kind of a dumb thing to do if you’re not 20. I figured headbanging music and crispy eats would help me stay awake. When I got to O’Hare, I printed my boarding pass at the check-in terminal. There was a gate number, and a “See Agent” note where my seat number should have been. I asked the woman taking luggage what it meant. 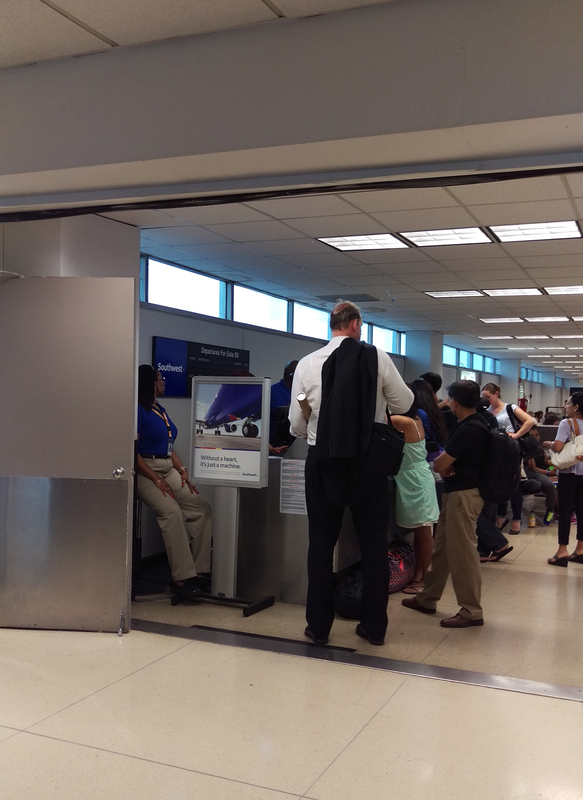 “It means see the agent at your boarding gate,” said the concierge-type guy standing near her. Not reassuring. But before long, I’d bonded with a 20-something who was traveling with her mother and stepfather. They’d all bought their seats together, but a hack of United earlier that day had somehow resulted in her reservation disappearing. Passenger Smith, waving a boarding pass, would rush to the gate, jumping up and down like a game show contestant who’d just won $1 million, then cartwheel down the jetway while juggling carry-on bags. We got to Buffalo at midnight. I headed over to Budget where I’d rented a car. (The rental agents had been dealing with frustrated passengers for hours, and because I wasn’t a total cow, the agent upgraded me from a compact to a gorgeous SUV.) Two hours later, I was on the far side of Rochester, where I crashed on a cousin’s couch. 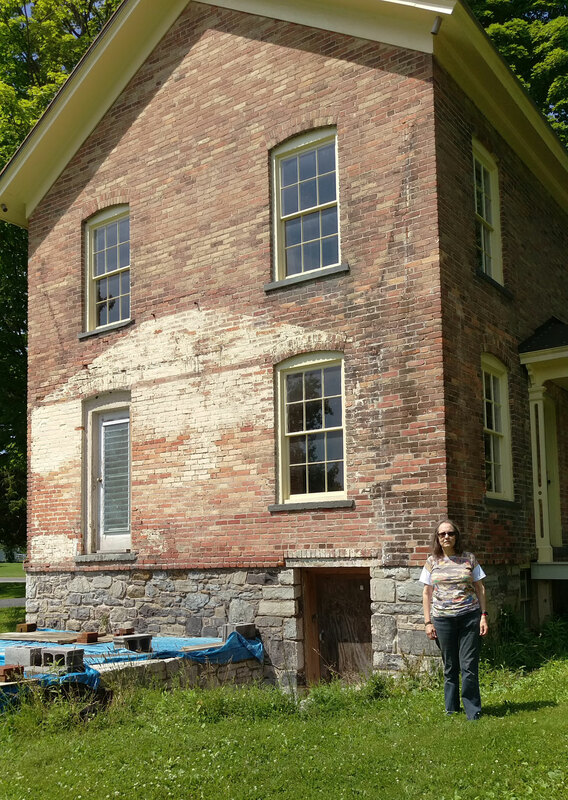 I did what I came to do in Skaeneateles (with one unscheduled stop at the Harriet Tubman House in Auburn – highly recommended if you ever find yourself in those parts), and headed back to Buffalo on Saturday to catch my flight home. This is the best $5 you will spend anywhere. Go and see this place – the museum, the houses, the tour. So worth it. 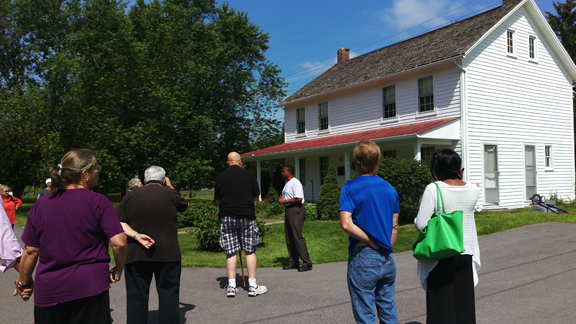 This is the house where Harriet lived. 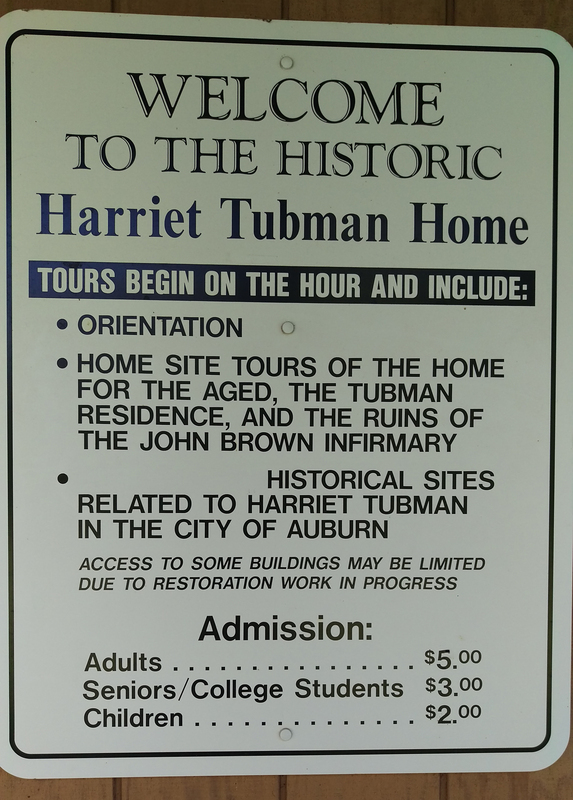 It was recently acquired by the African Methodist Episcopal Church, which already owned the 25 acres adjacent because Harriet left it to the AME Church. It isn’t yet open to the public, but is expected to be by this time next year. Oh, and that’s me, standing by the root cellar entrance. When I got to my gate – with a seat number on my boarding pass this time – Jessica was making the same announcement Tyler had been making. I figured I’d balance my karma and give up my seat. There ended up being eight of us – a woman who said she could drive back to Rochester, a father and son from Canada, and me who’d volunteered. Then there were the people who hadn’t. One was a tall man with a deep voice, German accent and commanding bearing. Picture a younger, handsomer Arnold Schwartzenegger having a righteous fit. His wife, a lovely caramel-colored woman with short braids, didn’t speak English. We all empathized with Arnold, but none of us were thrilled with the way he was taking he was taking Jessica apart. The kid was a gate agent. He was yelling at her as if she were the the company CEO. Eventually, the rest of us trying to be kind to Jessica and, possibly, the time and energy that it took to keep ranting got to him, and Arnold turned out to be reasonably okay. But none of us – including Jessica – were okay with what happened when she started trying to get us onto other flights. All eight of us disappeared as if we had never existed. A single supervisor buzzed by occasionally, pushing buttons and telling Jessica things that didn’t seem to help when she tried them, and then disappeared again. Jessica was on the phone, trying to get us reinstated, but whoever she was calling seemed to know even less than the supervisor. She was doing everything she could, but it was like aiming a squirtgun at a house fire. All of us – and I include myself and Jessica in this – had moments of not being our best selves. But in poor Jessica’s case, it meant a couple of intervals where she simply couldn’t hide the toll her inability to resolve a simple matter was taking. Which is why, United, in addition to the $500 voucher I got at the end of this ordeal, you owe me a travel pack of tissues. Which I will forego if you would kindly supply your gate agents with a stock of them, because if you’re going to hang your employees out to dry in these kinds of situations, they’re going to need them. She finally presented us with boarding passes and vouchers. The other passengers got hotel and meal vouchers which I didn’t need, United, because my best friend from middle school picked me up four hours after she otherwise would have and brought me home to her house. You owe her for saving you a hotel room bill and another tantrum. Why I didn’t have to throw a tantrum. I got to sleep here. That’s because, United, one $7 meal voucher is NOT enough to buy dinner. It was also the point at which the mild-mannered Canadian had finally had enough. I told Jessica to give him mine. Then, I looked at my boarding pass. Her instantaneous response came straight from her heart, United, and left no doubt in any of our minds that this woman is way too good for the likes of you. I started this post in Buffalo in the midst of a United Airlines debacle. I am finishing it at Laguardia Airport in the midst of a Southwest Airlines debacle. Clearly my flying karma is impaired. So far, I’ve arrived everywhere I planned to go (for which I am grateful), but the getting there has been, to put it frankly, a shitshow. This past Saturday, Sweetheart and I got up at 3 a.m. to catch a 5:20 a.m. flight to New York. 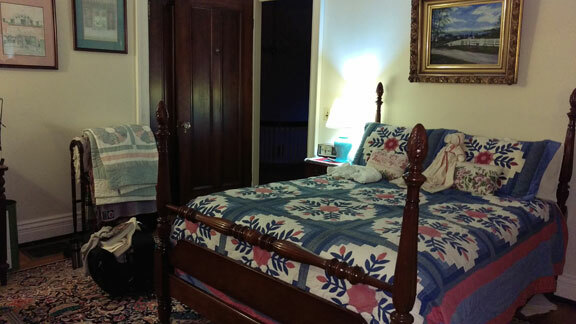 This was a planned trip, for something good – a dear friend’s surprise 60th birthday party. Our flight was supposed to arrive at 8:40, and we were going to meet another friend at Penn Station at noon. As we circled above the airport at 8 and change, the pilot announcing that we were third in line to land, he suddenly realized that we needed gas. Off to Albany we went, on a refueling mission. When we landed in Albany, the pilot announced that LaGuardia was closed due to storms and we’d be there for an hour. They let us off the plane. Sweetheart hit up McDonald’s, and I got us some caffeine at Starbucks. An hour later, we were taxiing out to the runway and the pilot was announcing our arrival time at LaGuardia. Moments later, he was announcing that LaGuardia was closed and we were going to hang out on the runway for another hour. Five minutes later, he was telling us it would be two hours. There’s a Meditation Room at Albany International Airport. I laid myself down on a rug and sacked out for awhile. Then I read until it was time to reboard. We got to LaGuardia at 1:45. But I have to say, Southwest, I didn’t feel violated in the way I did the week before, because you let us know exactly what was happening. You didn’t do so well on the trip home. We got to the airport in plenty of time for our 6:55 flight – enough time to catch this announcement about the Denver flight leaving before ours. When that didn’t happen, Southwest, you pulled a 10-year-old off the plane. He was flying with a single chaperone and nine other 10-year-olds, who were heading toward a baseball camp. The chaperone had a choice to stay with the left behind kid and abandon the other nine, or to leave him in an airport on his own and stay with the ones who were flying. There was some drama and haggling, since you weren’t offering a hotel voucher, but once you did that, someone volunteered to give up her seat so the kid could fly with the rest of his team. 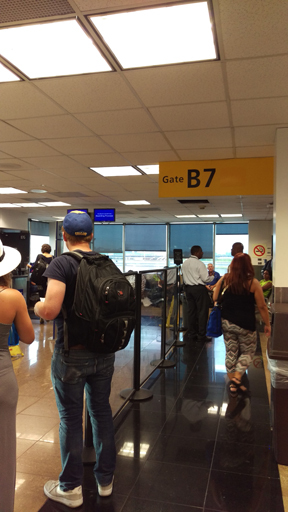 Gate 7, where we had a front row seat to watching a ten-year-old on his way to camp get bumped off his flight, unlike his chaperone and the other eight campers with whom he was traveling. 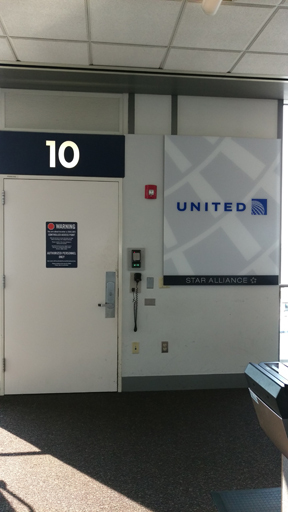 The gate agent station, where Sweetheart and I told the gate agents what was going on with musical planes. Off the lot of us schlepped, down the hallway to Gate 5, where we watched a group of passengers trooping off the plane parked there. I made eye contact with one, and she spoke. As the Gate 5 people were getting on the plane parked at Gate 7, I watched a ground crew member shuttling a flight crew down a flight of stairs to some unnamed destination. Their expressions ranged from bewilderment to disgust. Turned out it was the flight crew who’d been hustled off “our” plane. The Gate 5 passengers and their flight crew got on and took off. 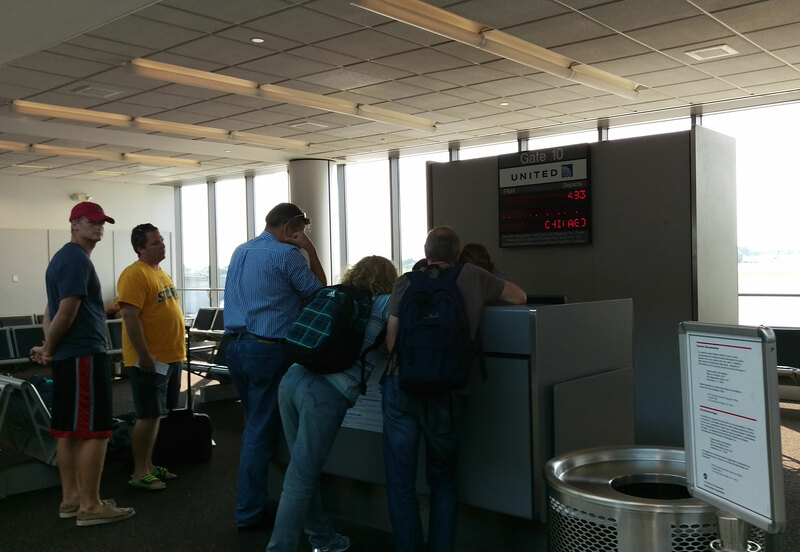 Meanwhile, Sweetheart and I were asking the agent at the counter just around from Gate 5 what had just happened. Which is kind of how it went. There was a lot of mystery, no straight answers and eventually – hours later – a plane arriving from somewhere. We were all herded back to Gate 7. A group of passengers got off, our flight crew boarded, and at midnight, we were home. Props to Southwest for giving us all $14 vouchers for dinner at Au Bon Pain on the concourse (United: Take Note) and $100 coupons toward our next trip (should we be courageous enough to try this again). For now, I’m breathing a sign of relief that next week’s scheduled departure – to the Revolution Reunion – is a road trip. I admire your writing. It makes me feel like we are having a conversation and I wish we were able to have more. Airplane travel these days makes me feel like the passengers in steerage in the movie ” Titanic.” Our national class system is getting a lot more crass about the steerage class. Regarding the German traveler and United, It also am generally embarrassed as an American that our transportation services and infrastructure are so subpar.